Warcop Art and Craft Exhibition a Great Success! Warcop Art Exhibition a Fantastic Success! 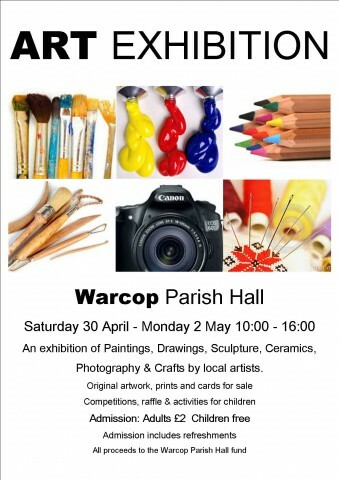 Warcop held its first ever Art & Craft Exhibition in the new Parish Hall over the Bank Holiday weekend of 30th April to 2nd May. Organisers have hailed it a huge success with well over 400 visitors who came to see a wide range of local artistic talent on show. All the exhibitors commented on how light and attractive the Hall is and they were all keen to return for any future exhibitions. Visitors came from many local towns and villages with several coming from further afield. Children were encouraged to come along as every pupil at Warcop C of E Primary School had drawn a picture which was on display. There were activities such as a treasure hunt and a drawing competition with prizes. About 90 children came over the three days. Visitors also enjoyed having to choose their favourite exhibit. Feedback commented on the huge talent on show, the variety of work and how well organised the event was. There were paintings by Sara Sylvester, Ann Sandell and Margaret Shaw, photographers such as Alan Roberts from Kirkby Stephen and Hazel Deighton from Bleatarn, rugs and quilts, bead work, wood-turning by Phil Sampson and sculptures by James Popps from Brough. The exhibition was organised by the Parish Hall Events Group and in particular by David Keetley, Peter Foskett, Hazel Deighton and Vivienne Willcock. Special praise goes to Peter Foskett who designed an amazing zig-zag display system made from 8’ x 4’ boards painted white. He also designed the posters/flyers and the distinctive exhibition logo. Over the weekend, a large team of helpers staffed the Hall covering entrance fee, raffle, sales and refreshments. Glenda Burton, Caroline Shaw, Vivienne & Richard Willcock, Karen West, Mark and Carol Blackett-Ord, Lois Wiseman, Sue Fell, Pat Brady, Sarah & Grace Harrison, Carole White, Judith Heelis, Jenny Ramsden, Ray Bromby, Susan Coffer, Amanda Daldry, Hazel Deighton, Joyce and David Keetley and Peter Foskett. Colin Harrison, Gordon Deighton and David White also deserve great thanks for their contributions to putting up bunting, signs and transporting the boards to the Hall! Many of the contributing artists donated prizes for the raffle, including prints, originals, wood-turning and bracelets. Over £1200 was raised from the exhibition and these funds will go towards much-needed equipment for the new Parish Hall.